An increasing number of K-12 schools are transforming classrooms, libraries or other spaces into Informal workshop environments where students can tinker or invent, and with good reason. According to The NMC/CoSN Horizon Report: 2016 K-12 Edition, "Makerspaces are also increasing student exposure to STEM subjects and technical disciplines. Learners are applying maker skills to address some of the world's pressing challenges with innovative solutions." But how do makerspaces get started? THE Journal spoke with several experts, who shared their insights into the makerspace planning phase — not just designing or equipping the space itself but preparing the students and staff so that they're able to make the best possible use of it. Almost any space in a school can be repurposed as a makerspace. Harmony Public Schools in Texas has created makerspaces in several of its schools. One merged two classrooms into a single space to house an physics lab together with a makerspace, while another did the same thing to create a hybrid engineering lab and makerspace. Yet another school in the district converted a storage room into a library and makerspace. The school district is also repurposing a 4,000 square foot storage space next to its central office into a makerspace that will serve several schools. Some other districts have created makerspaces in school libraries. "Any space can be turned into makerspace," said Mehmet Gokcek, the STEM/PBL curriculum developer at Harmony Public Schools. While a maker culture can exist in virtually any space, it thrives in an open and active learning environment. "It's better to have a large, open space for kids to work freely through guided inquiries," Yilmaz said. "Students are going to have different teams working on different projects, or in different phases of the same project, and a large open space really helps increase their productivity and creativity." 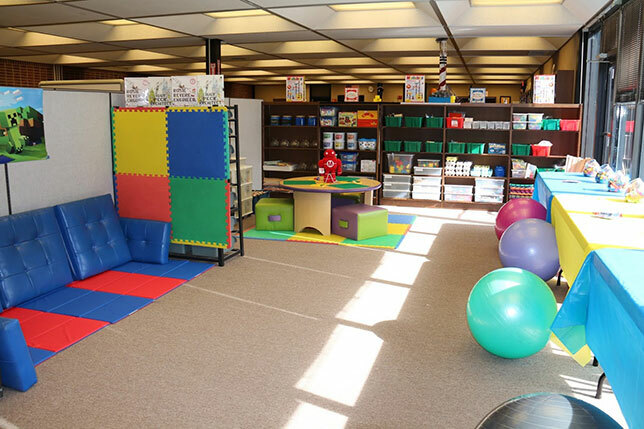 Winnetka Public Schools in Illinois changed out the furniture in all of its makerspaces to make it more flexible. "We have chairs on wheels and desks that flip up and nest, tables that flip and nest and can be rolled out of the way, or stacked so that you can just have a wide open space or you can have tables for kids to collaborate at," said Maureen Miller, director of technology. The space itself is not as important as establishing a maker mindset, according to Winnetka's Miller. "It's really just teaching kids that it's okay to tinker and play and to problem solve, and to build those other skills of collaboration and communication and critical thinking," Miller said. "The space helps, but it really doesn't matter." Montour School District in McKees Rocks, PA has focused on establishing a maker culture and developed a purpose statement to help keep everybody on the same page. The district's purpose statement is "to establish and support a maker culture through 21st century resources linked to Montour's curriculum to provide students with authentic learning experiences," said Justin Aglio, director of innovation for the district. To get ideas for establishing a school makerspace or maker culture, Miller suggests visiting established makerspaces in other schools, universities, public libraries and museums. "There are so many different opportunities to see makerspaces in action now," she said. The Children's Museum of Pittsburgh has a Makeshop where families can do woodworking, circuitry, textile processing such as sewing and weaving, and stop-motion animation. The Makeshop also lets visitors take apart recycled toys, electrical systems and small appliances. When Montour School District was planning for its maker culture, two teachers spent an entire day at the Makeshop "to see what a makeshop looks like outside of a school, in a museum setting, and watch students interact with some of their stuff that they do," Aglio said. During the planning phase, it's a good idea to involve as many stakeholders as possible, including teachers, students, parents and administrators, according to Miller. Montour School District brought in someone from the Children's Museum to speak with the PTA about makerspaces. Jennifer Kosarych, a kindergarten teacher in the district, said she thinks it's important to get student's input as well "to see what their interests are because we know that if they're interested in it, then they're more willing to try and be open to new things." The planning process should alsoinclude "student choice and voice, as well as teacher choice and voice," said Harmony Public Schools' Gokcek. Burak Yilmaz, project director at Harmony Public Schools, think districts should even consider involving local business and industry leaders in the planning process. The list of materials and equipment that students can use in a makerspace is virtually endless, including 3D printers and scanners, microprocessors, robots, power tools, sewing machines, construction toys, cardboard and duct tape. Before purchasing anything, districts need to know what educational goals they want to meet. "One of our responsibilities at the district level is to make sure that all of the activities and projects available in our school makerspaces are aligned with the learning objectives and the standards expected by the state," Yilmaz said. Algio describes the process as embedding the maker culture into the curriculum rather than layering it on top. When selecting equipment, Aglio and his team looked for things that teachers could easily embed within their curriculum, and that students could use. "Make sure that it's age appropriate," added Kosarych. However, it's important to strike a balance between meeting standards and open inquiry, according to Gokcek. At Harmony Public Schools, students build projects with educational objectives embedded into them, "so it's guided, but not so much that students doesn't feel ownership of their own project," he said. Regardless of the space, equipment or goals of the makerspace, it's important to start small. "Pick one, two or three things, if that's all you can afford, and do those well," Miller said. "And then add more in each subsequent year." Maker culture is very new to many teachers, and starting small and simple can help them make the transition. According to Kosarych, "by allowing the teachers to go in there and just let their kids explore, it's helping both the teachers and students get comfortable."